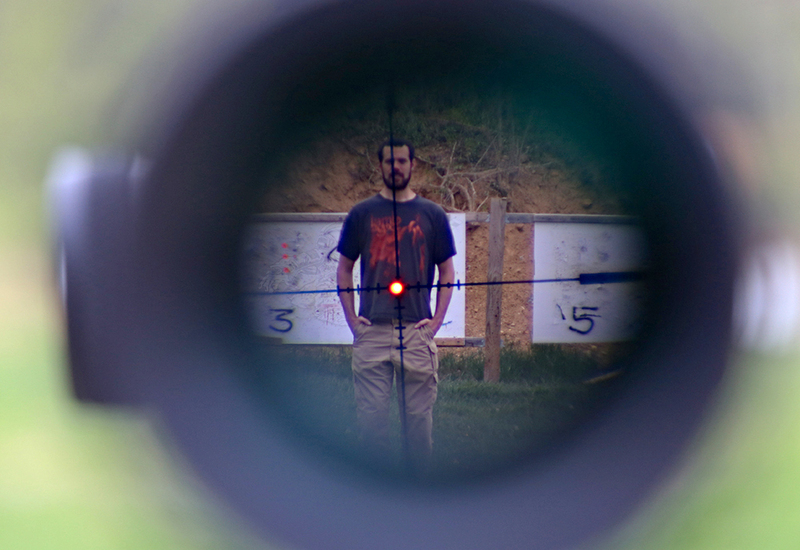 Are some optics better than others when shooting at people? Why and what characteristics would these optics have? 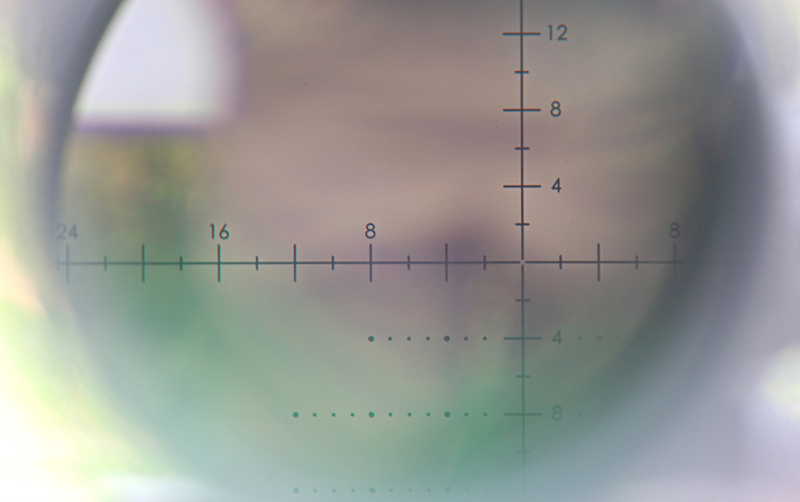 What optics with what reticles allow for most effective and efficient PID at what distance? I decided to find out with the help of a buddy of mine, and we gathered up a bunch of different optics people employ as well as optics that have a bit of magnification. Since I know someone will wonder and undoubtedly ask, all optics were removed from their firearms and the Glock side the RMR was attached to had the barrel removed - always be safe. Let's start off with some terminology, PID means positive identification which is a military term that is part of the rules of engagement (ROE). Positive identification is required prior to engagement. 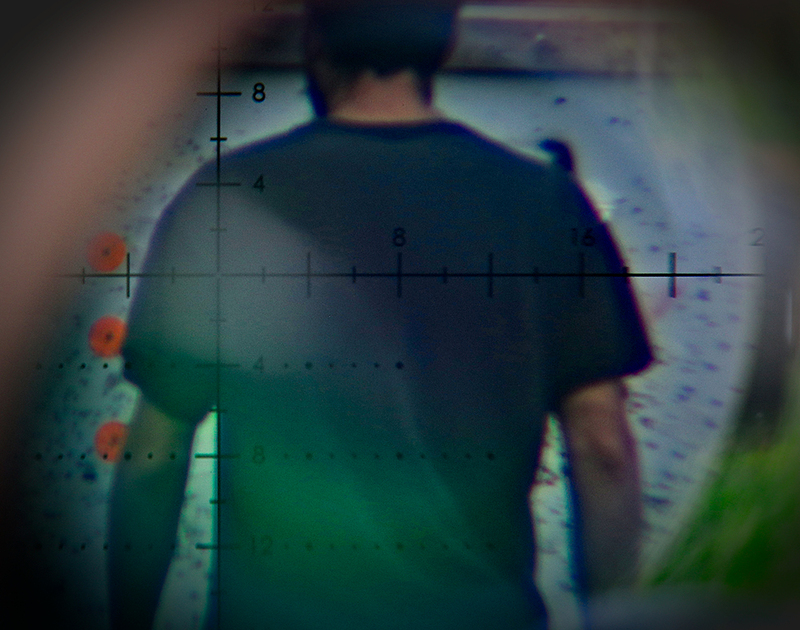 Positive identification of hostile enemies is absolutely required in order to pull the trigger. You may remember this scene from American Sniper , where the trigger could not be pulled until there was a threat to others. This is integral to military operations but it is paramount to using deadly force on US soil against another US citizen. There is also a very clear moral and ethical issue because positive identification allows for the prejudicial use of deadly force against someone who may not even know they are being targeted. What type of PID are we looking for? Viable and immediate threats to you and others. A person walking down the street or on the countryside with a rifle or pistol in hand. The ability to make out insignia and other identifiers is essential in making the decision to shoot or not. Consider enemy combatants in the middle east who all look very similar, sometimes the only identifier would be a patch or a black flag hanging out of a pocket or wrapped around something. Being able to PID the threat from a distance and effect it with precision fire is extremely important. Why is PID important and why does the type of optic you have on a rifle matter in this context? The above is my PWS PDW. 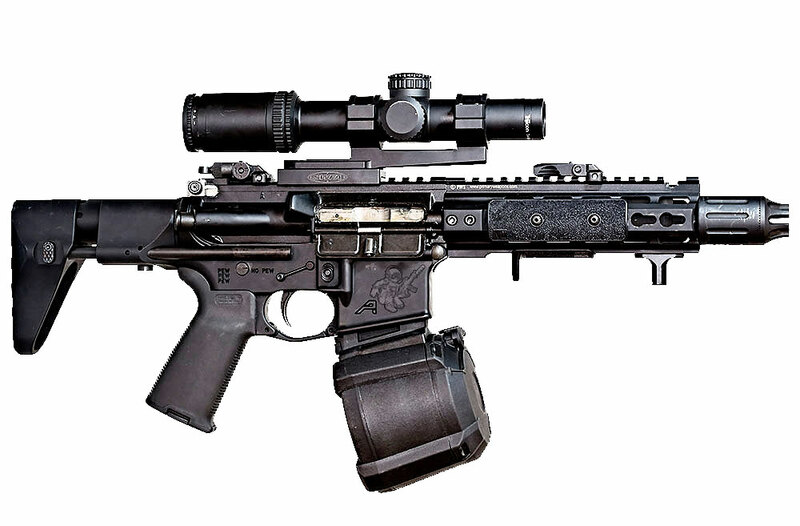 It has a Trijicon Accupower 1-4x on it, specifically because I need to be able to PID targets at a distance which coincides with the rifles ability to provide precision fire. You may be thinking, 7.75 inch barrel at 100 yards? Yeah right! Well I have done some shooting of various loads and when utilizing 77gr OTM 5.56 ammo I can produce 3 inch groups at 100 yards using the above optic at 4x with the picture rifle. If I had a 1x red dot sight optic could I do that? Probably not. The more important question is would I be able to PID the target with a 1x optic and be able to produce 3 inch groups in the real world? Would I want to try? No. With an optic which has 4x magnification and understanding how a properly calibrated zero works, even this short barreled rifle can produce precision shots at 100 yards. This is one of the reasons for this article and a proof of concept for those who need to have chalk board, 5th grade style, explanation of why a variable magnified optic on a short gun is absolutely necessary for the real world application. 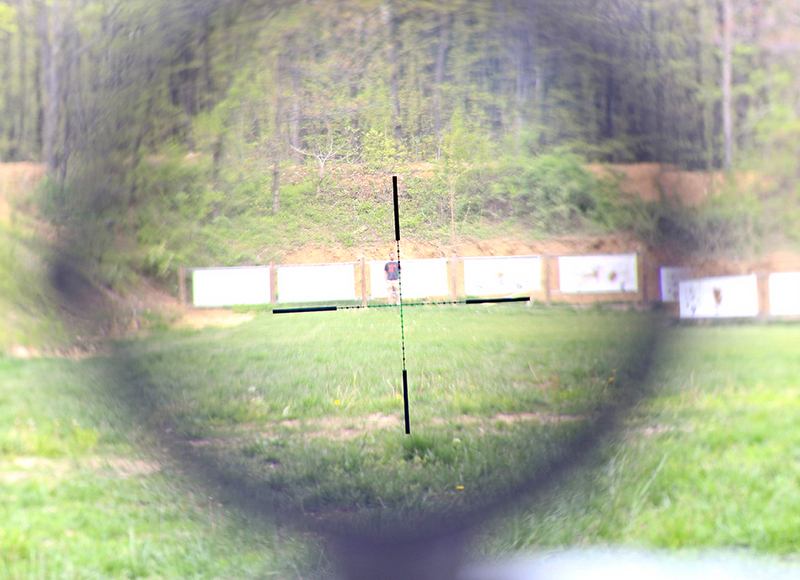 As one of the fundamental rules of gun safety, knowing your target and knowing what is beyond your target is mostly disregarded on a square range. With a variable magnified optic it becomes ever more applicable and this really applies to use of deadly force and liability. It is not enough to PID your target, you must be able to see beyond it and understand the trajectory of the round you are about to fire, especially if you are pulling the trigger on something really hot like a .338 or .300 Win Mag. Photography considerations - It is pretty easy to photograph red dot optics that are 1x and have no magnification. 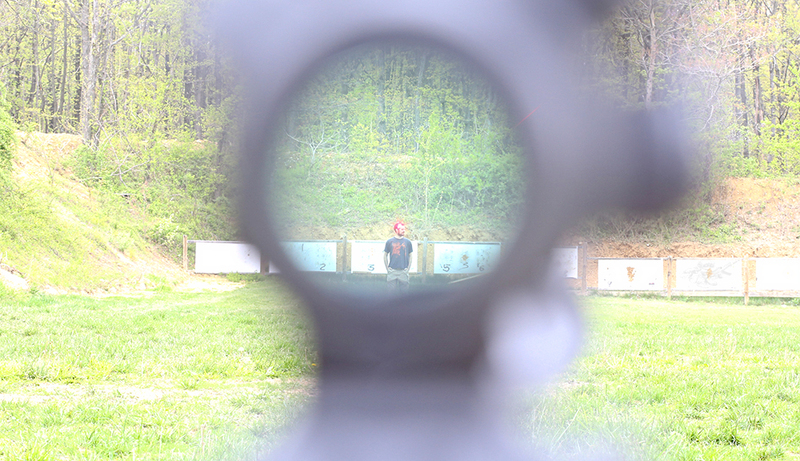 When you get into first and second focal plane reticle'd optics you start working with a pretty significant barrier that requires a lot of setup. 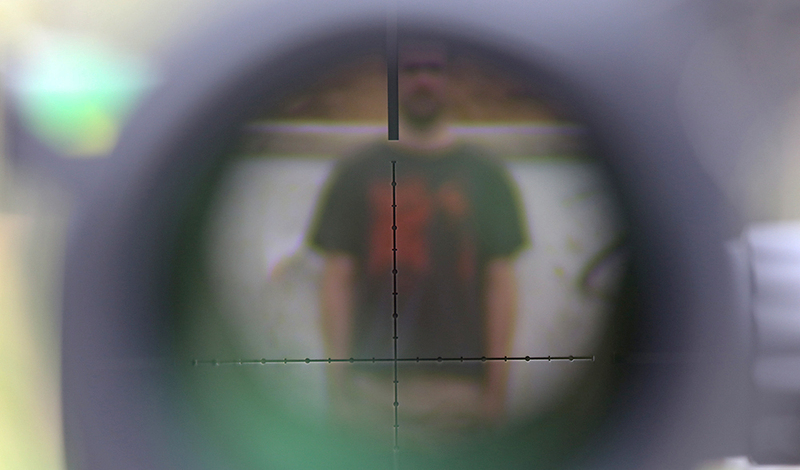 Some of the photographs will not be centered and some will focus on the reticle and not the target. Above is a Trijicon Accupower at 1x with the green LED cross hair on number 8 setting (it will be on 8 setting throughout this article). 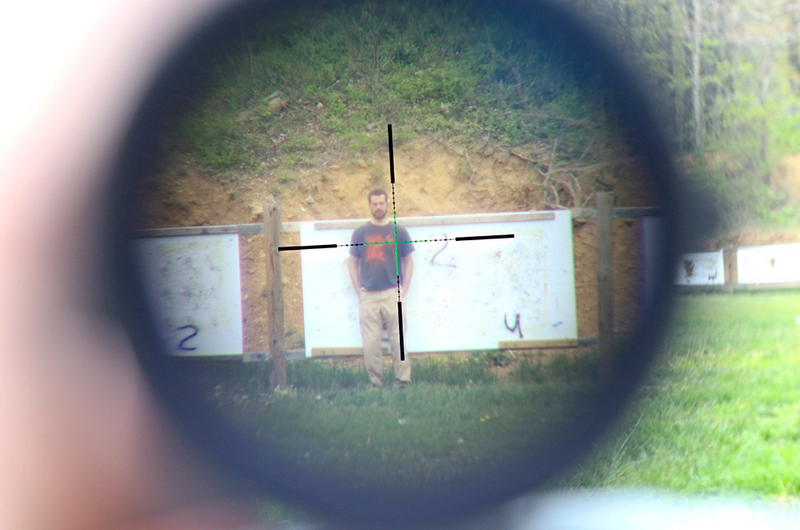 As you can see at 1x at 25 yards you can make out the target, clearly read what is on his shirt and if there is anything in his hands and see what is beyond him. Trijicon Accupower at 4x. Reduced field of view at 25 yards but you can make out pretty crisp details. Trijicon RMR 3.25 MOA at 25 yards, you can clearly see the dot, clearly make out the target, 9mm effect at this distance is dependent on accuracy. 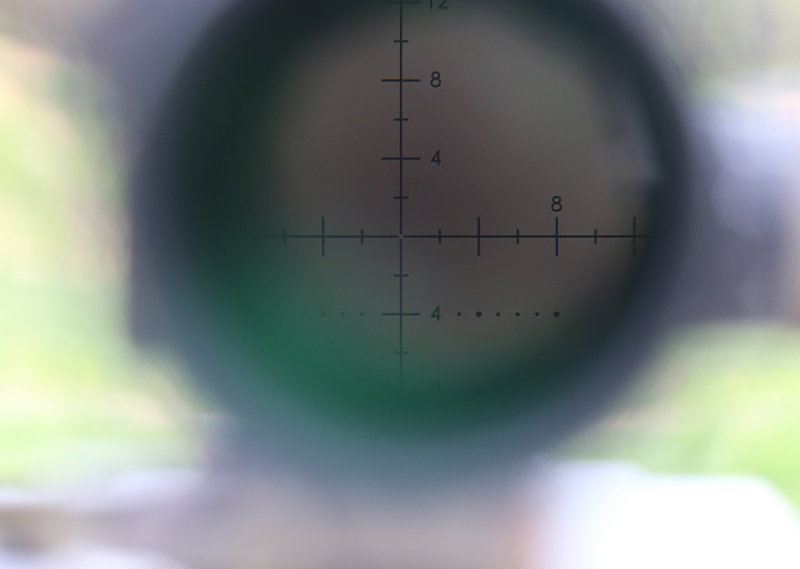 Aimpoint PRO 2 MOA, clear target ID and RDS placement, background visible through optic. Trijicom MRO 2 MOA, 3 setting on power for brightness, full view of target at 25 yards, good situational awareness through optic while on target. USO SR4c 1x with red dot on maximum brightness at 25 yards, clear PID and background visibility. USO SR4c 4x with red dot, clear target visibility and identification, background visible somewhat due to proximity of target. 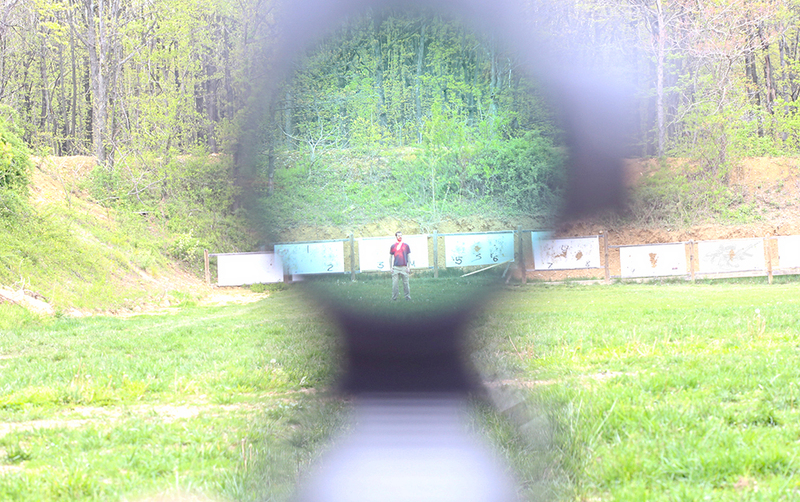 Vortex Viper on 24x power at 25 yards, as you can see you cannot see past the target and you will only be able to get a small part of the target clearly visible at this distance through the optic. Nearly unusable at maximum magnification. 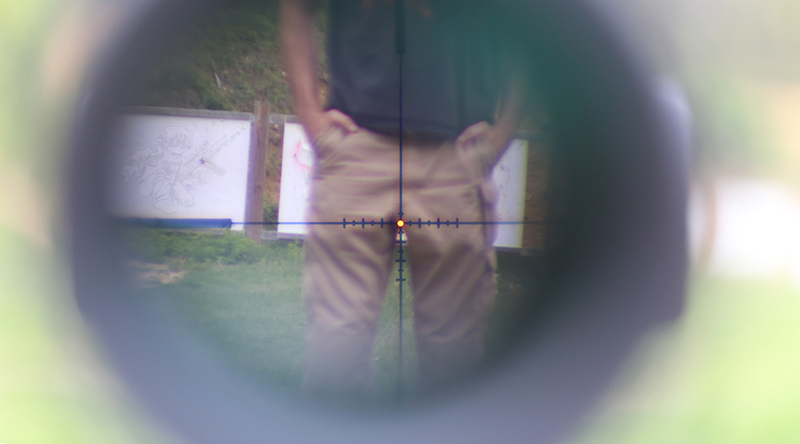 Millett at on 16x power at 25 yards, completely unusable in terms of PID and background observation. 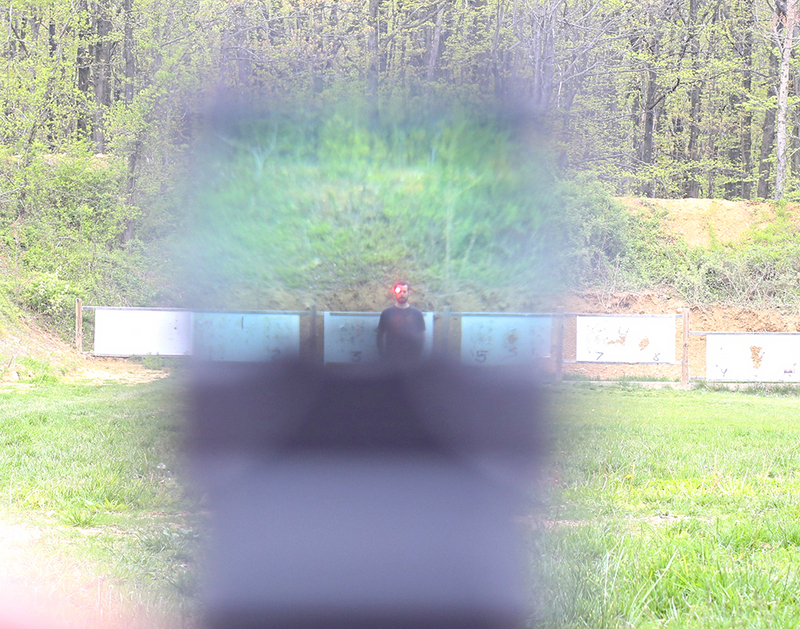 At 25 yards the red dot sight / optic is at home, as is the 1x or even 2x setting of a good magnified variable optic like the USO SR4c which has a "red dot" built into the reticle for this specific purpose. The MRO really shines here because of the field of view and larger than standard RDS objective. 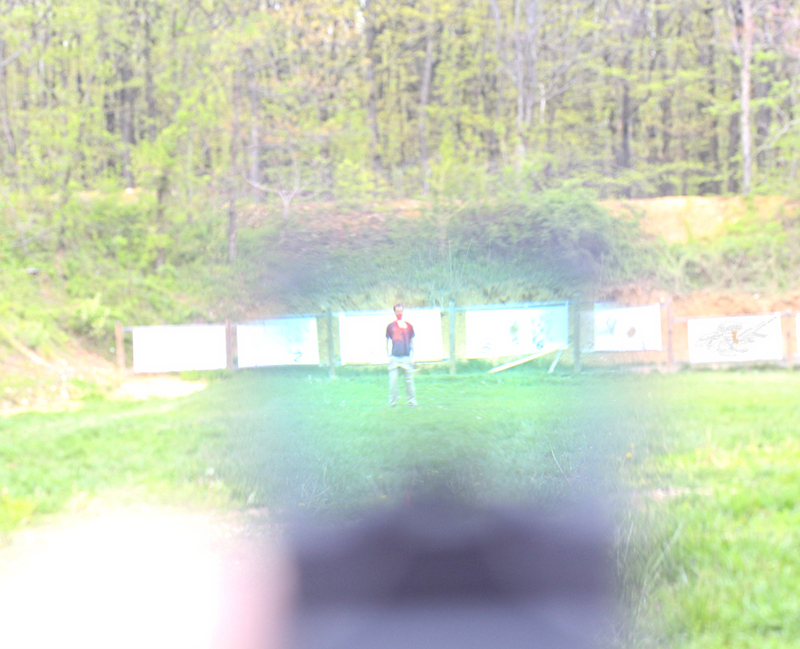 A crisp magnified optic with a near-to-true 1x also works really well here. Trijicon Accupower 1x at 50 yards, target somewhat identifiable, can still read t shirt and probably make out a flag patch if it was facing you. Background details crisp. PID still possible. 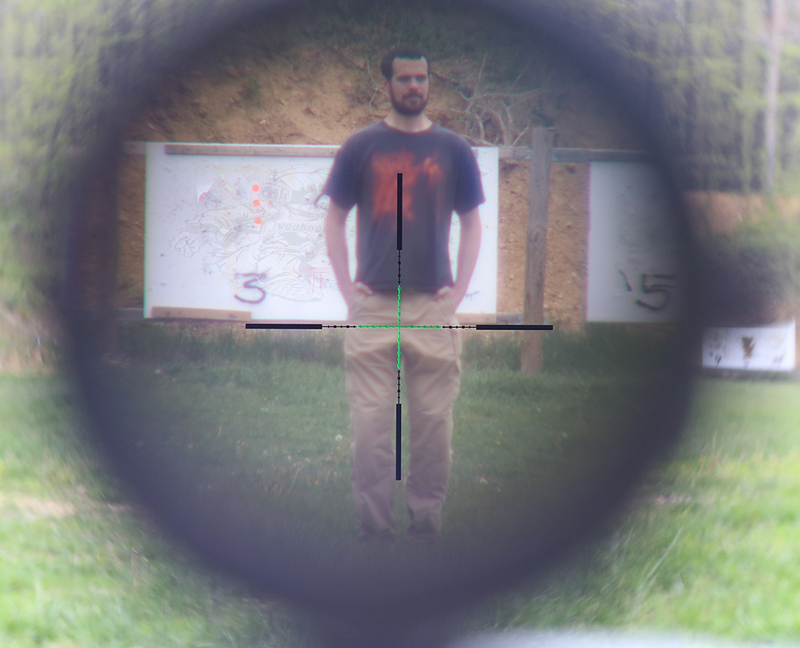 Trijicon Accupower 4x at 50 yards, PID of target very easy, t shirt readable and background details crisp. 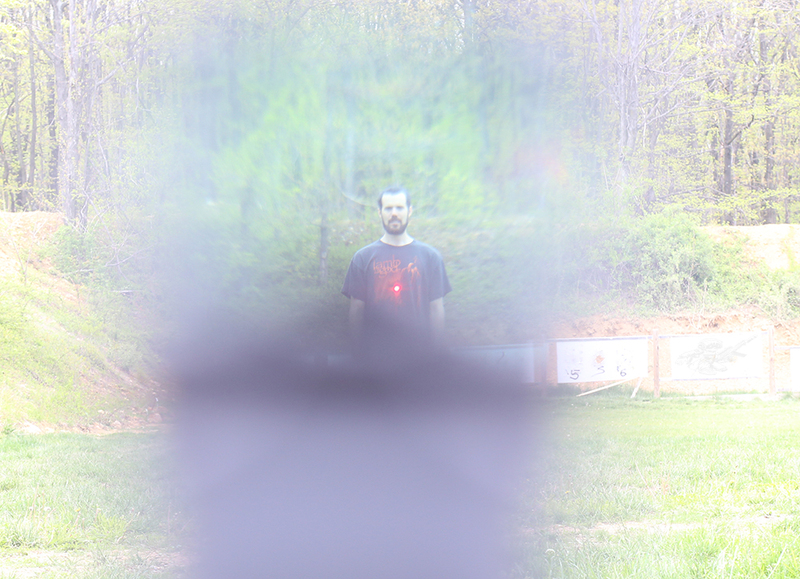 Trijicon RMR at 50 yards, 3.25 MOA reticle close to covering head of target, at this distance accuracy is the only way you are going to effect a target with 9mm or any pistol ammo so knowing hold over is very important. 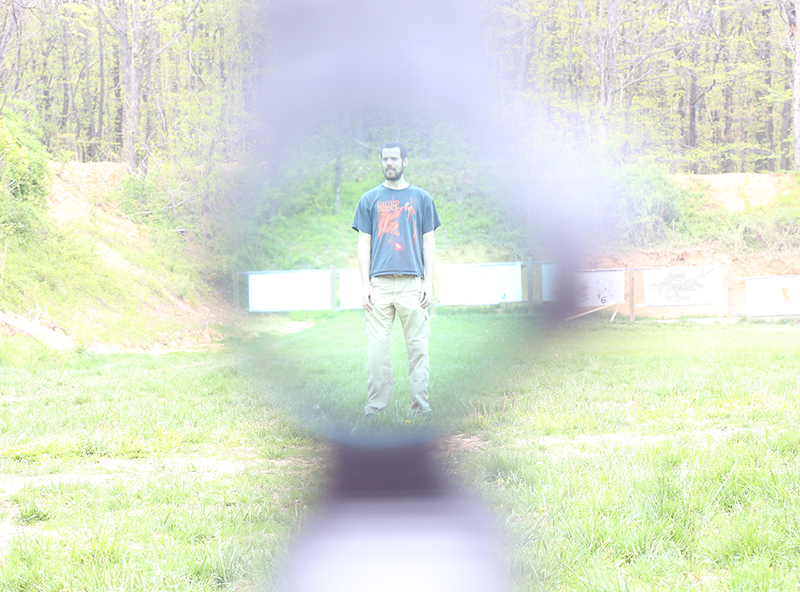 Background visible because optic is 1x and the RMR does not obstruct target area. 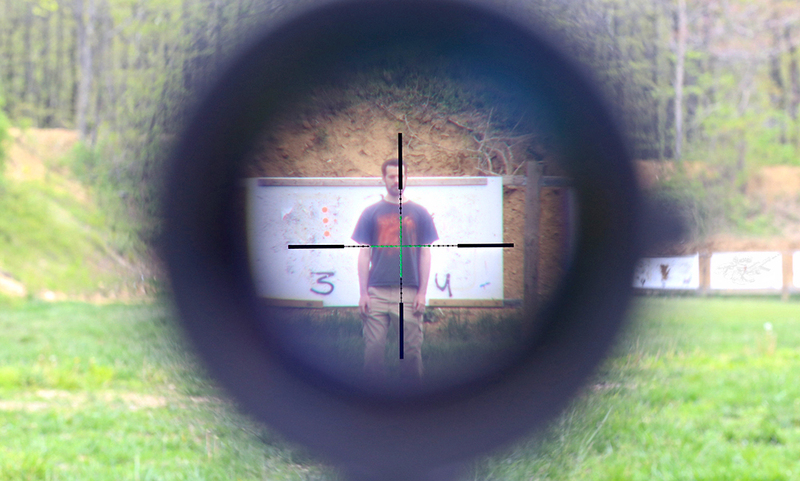 Aimpoint PRO at 50 yards, background still visible through optic though reticle at high power may cover target's head, still have usable target area visibility and PID. 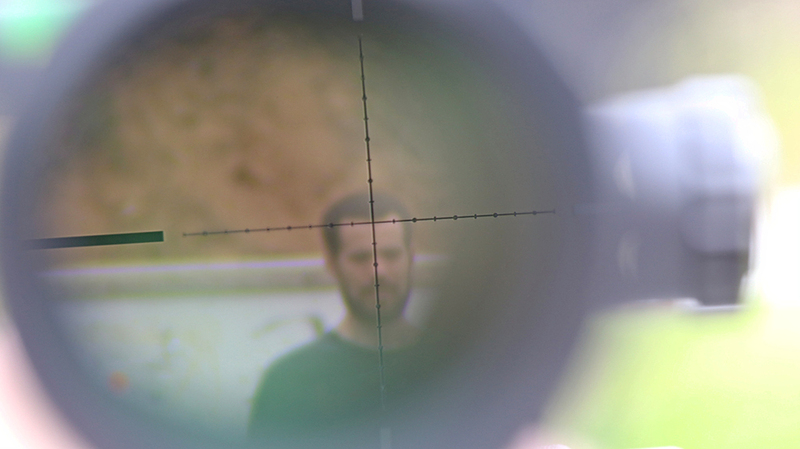 Trijicon MRO at 50 yards, background very clear and reticle is crisp. You may be wondering why it looks magnified, I can only say that is because of the camera lens focus point on the reticle there by enlarging the focus area because of math and providing an appearance of magnification, it is not actually magnified. This is the distance the MRO is at home because of the objective size and the clear ability to PID with the naked eye while overlaying the RDS. USO SR4c at 50 yards at 1x with RDS off. 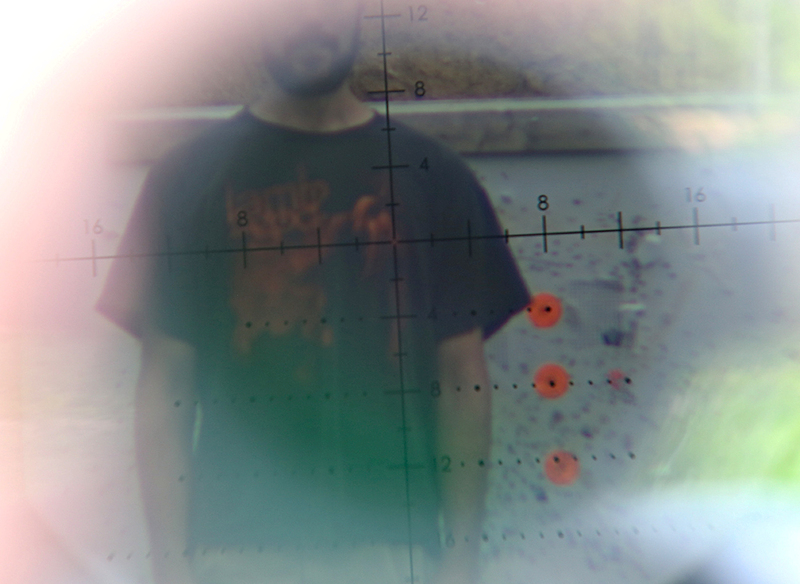 You can clearly make out target and background, PID possible though quick shots on target, especially while standing may be difficult especially if the target is wearing a black t shirt against a black reticle. USO SR4c at 50 yards at 1x with RDS on. 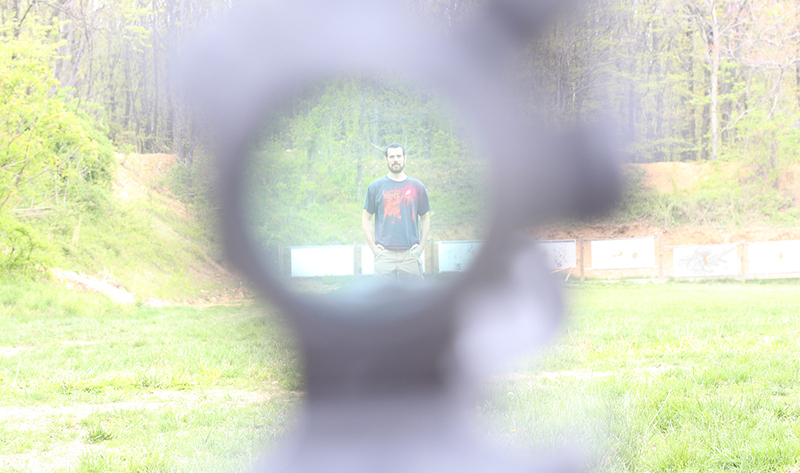 The contrast of the RDS against the target makes for an easier shot. The RDS is large enough to cover the targets head, so pinpoint accuracy at 1x is difficult but chest area shots are perfectly doable. USO SR4c at 50 yards at 4x with RDS on. Crisp target PID, t shirt clearly readable and patches could probably be made out as well. Background clear and crisp. Red dot allows for precision aiming. 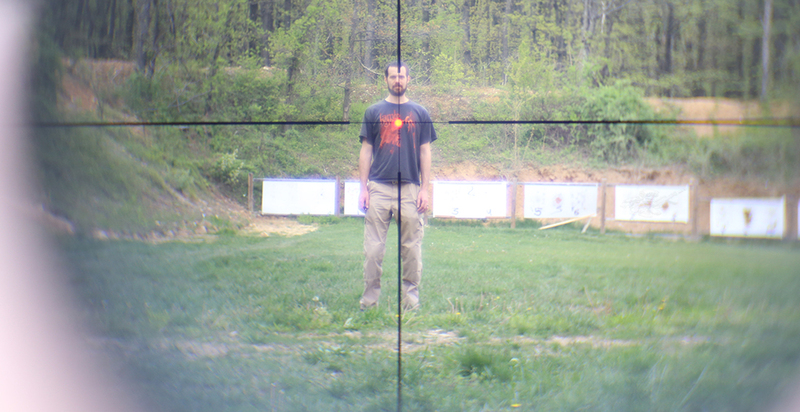 VX at 50 yards on 24x power. You could probably make out facial features, have a positive PID and probably read patches at this magnification at this distance. Background will be obstructed but very precision shots are possible. 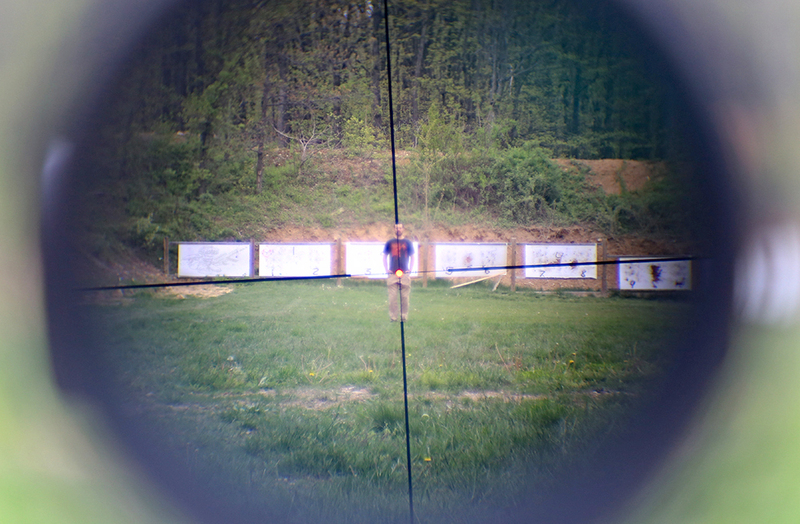 Target is blurry because of camera lens to optic focus distance math related issues. Millett at 50 yards on 16x power. At 16x the Millett provides for a clear PID and precision shot. Background is obstructed but not completely. 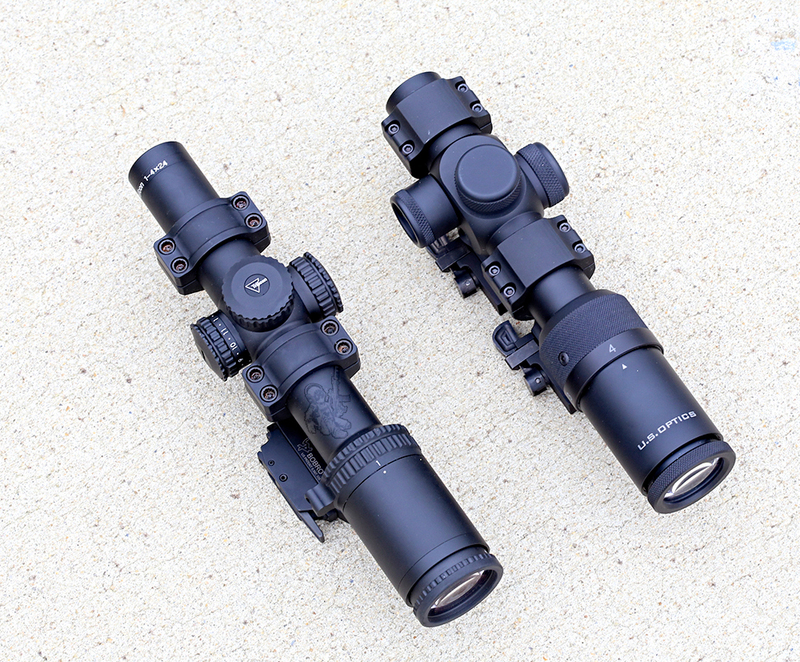 At 50 yards optics like the MRO with a larger objective really shine and any 1-X variable magnified optic will work really work, at 4x, 6x or even 8x you will have a clear ability to PID and use the optic for background identification ability. 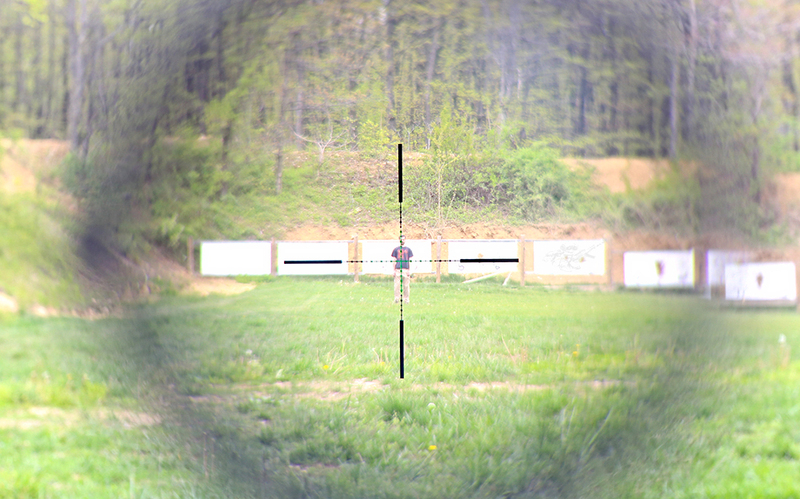 Trijicon Accupower at 75 yards on 1x power. Target PID is becoming difficult but still manageable. You could probably make out a rifle but probably not a pistol. A pistol and standard black smartphone would be indistinguishable at this distance and magnification. Background is clearly observable. Precision shot prone would still be very possible. 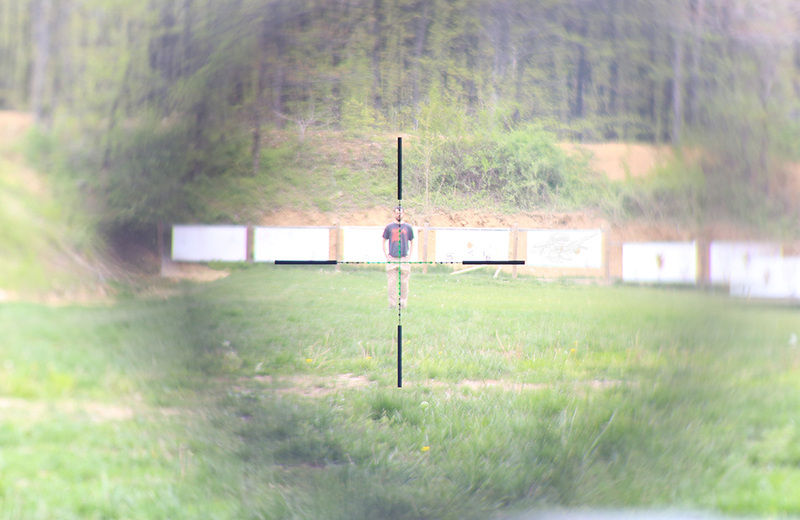 Trijicon Accupower at 75 yards on 4x power. Target PID is easy and background is partially obstructed but clearly visible. 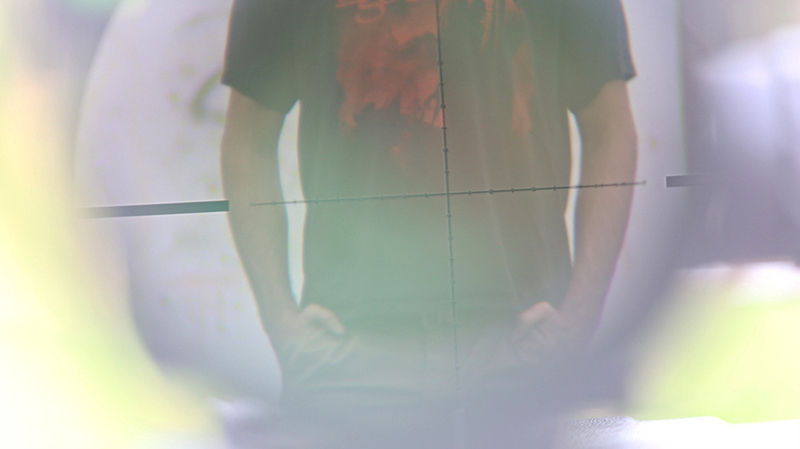 T shirt is readable so patches would be as well, precision shot from prone very attainable. Pistol could be identified clearly if presented. 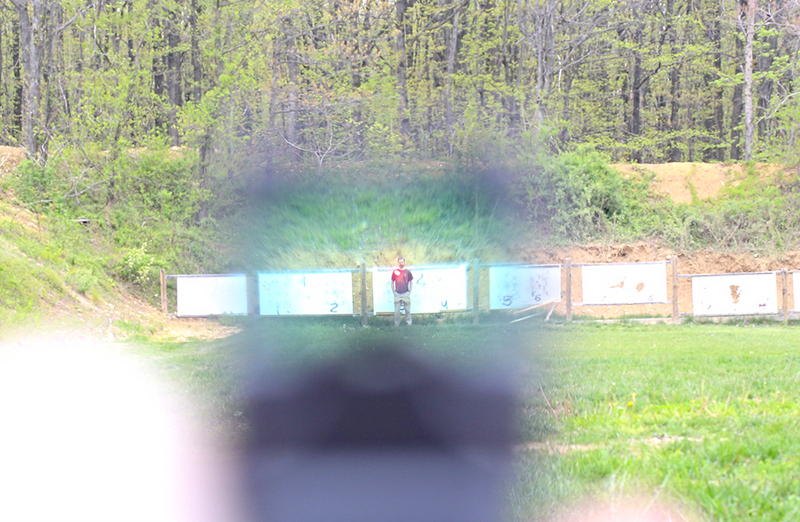 Trijicon RMR at 75 yards. As you can see the 3.25 MOA red dot would cover the head and a good portion of the targets chest. Precision shots from a 9mm (or another pistol caliber) at this distance would be difficult standing but possible, definitely attainable prone with proper trigger press. PID would be extremely difficult of a pistol though you would have the clear advantage if a pistol was presented especially one without an RDS on it. If a rifle is presented at this distance you could probably make it out with the naked eye, but would be on the low end of firepower and getting to cover would be top priority. 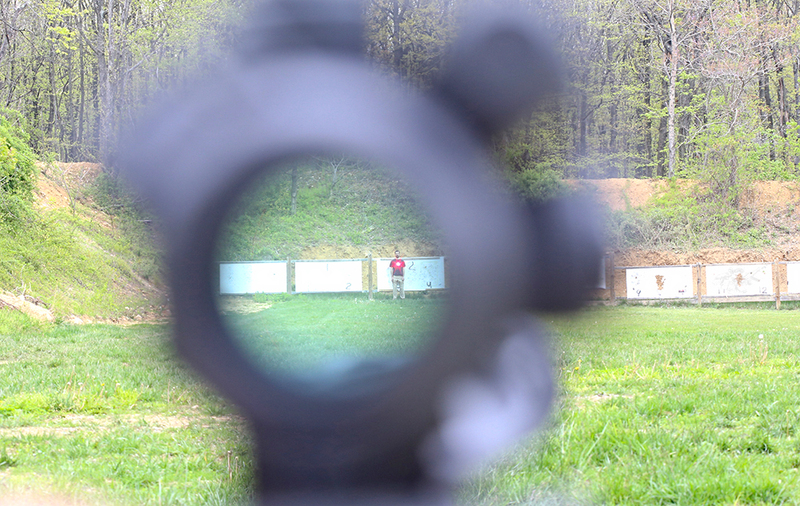 Knowing your hold over is an absolute requirement at this distance with pistol caliber. 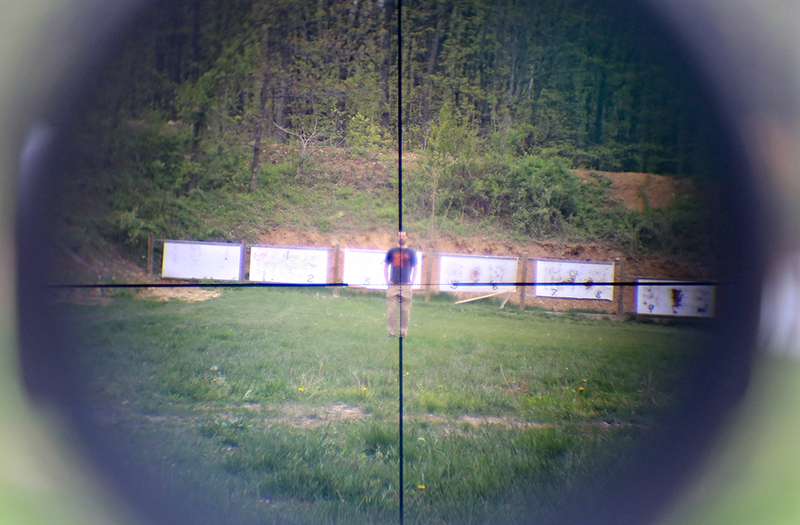 Aimpoint PRO at 75 yards. The red dot will cover the head of the target and is still crisp enough to provide effect targeting ability at the chest. PID would be difficult of a pistol but may be possible of a rifle, t shirt is clearly unreadable so any such written identifiers would be moot. Background clearly visible. 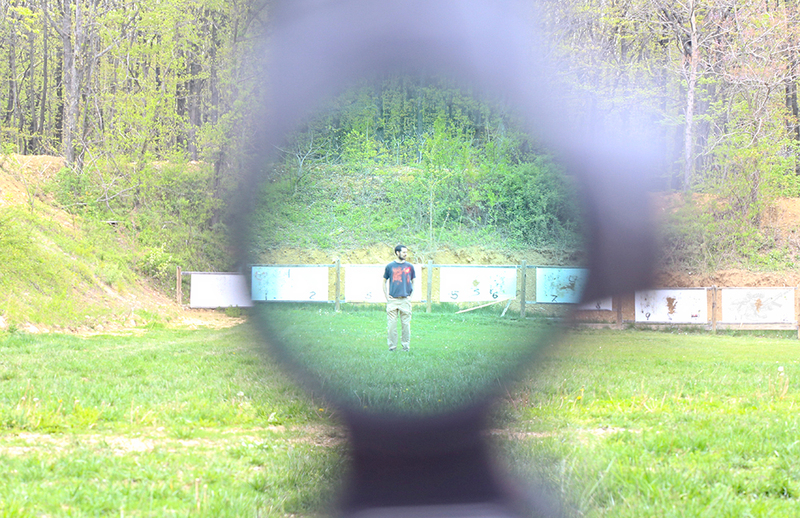 Trijicon MRO at 75 yards. Red dot clearly visible and background is unobstructed. PID is difficult of a pistol but may be possible of a rifle. Precision shots are possible on the chest area. USO SR4c at 75 yards on 1x with RDS on. As you can see the red dot will cover the head and most of the chest. 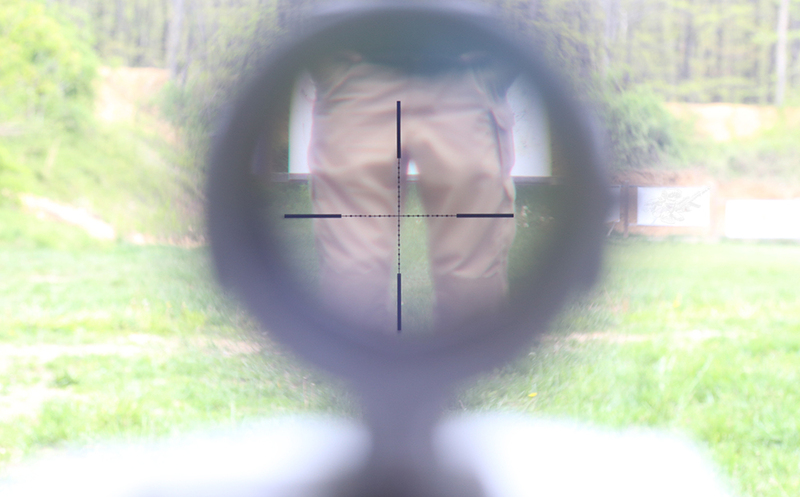 The target area and target are clearly visible however at 1x magnification the same issues arise as with the RDS optics. PID is difficult. USO SR4c at 75 yards on 4x with RDS on. PID is easy to establish prior to engagement. T shirt is readable and standard sized patches would be difficult but possible to make out. Pistols and rifles would be easy to identify. Background is crisp. Precision shots are very possible. 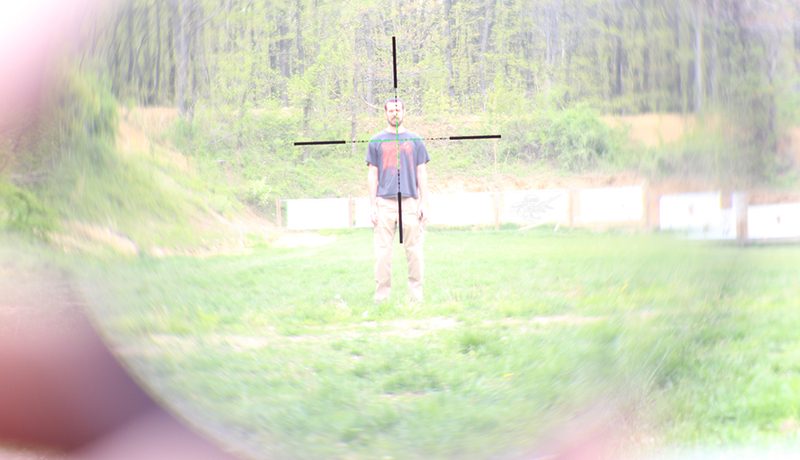 VX at 75 yards on 24x. Effective magnification for positive PID. Pistol and rifles would be identifiable and t shirt is readable so patches would be as well. Background still obstructed. Precision shots very attainable. Millett at 75 yards on 16x power. Facial features clearly identifiable as well as reading of t shirt and patches. Pistol or rifle would be identifiable and PID would be easily attainable. 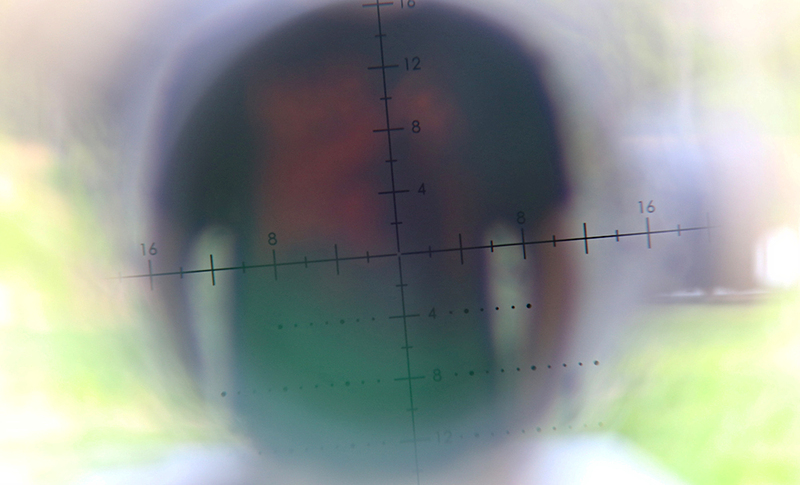 At this distance with this magnification a very precision shot could be made, almost surgical. Background is clearly identifiable. 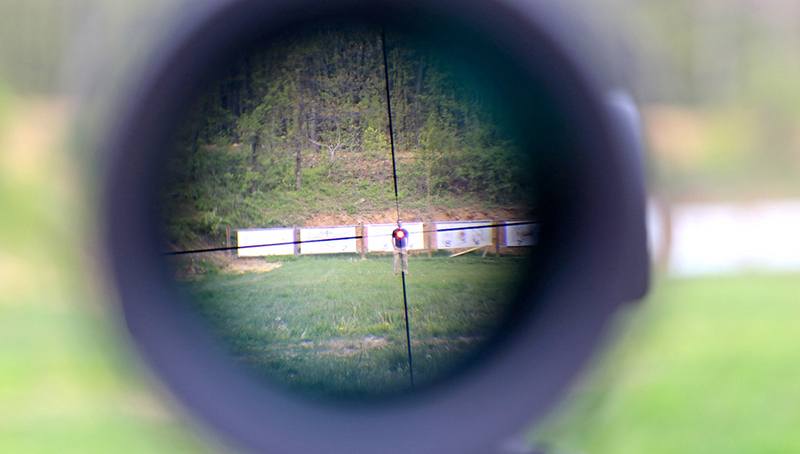 At 75 yards a magnified variable optic with at least a 4x power would be capable of delivering PID quickly. 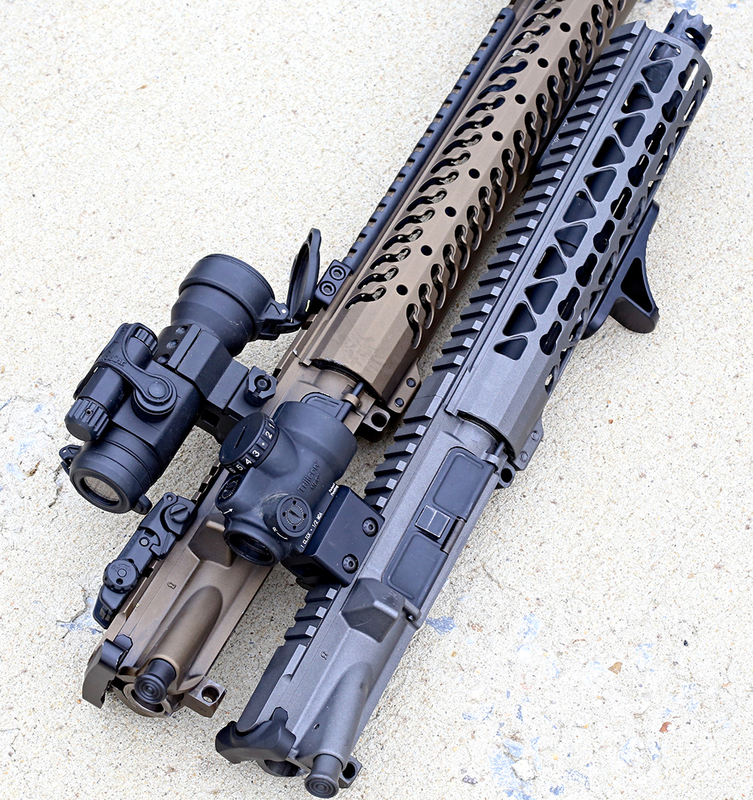 Higher magnification would be required to produce the capability of precision / surgical shot placement even for a 5.56 round, though it would be possible with a 4x, something a little higher magnification would be more applicable. Trijicon Accupower at 100 yards at 1x power. You can tell that there is a person down there and maybe be able to do height estimation with the reticle and possible distance estimation if you know how to use your particular reticle. A pistol and cellphone would be indistinguishable at this distance and PID would be extremely difficult unless you saw muzzle flash. A rifle may be identifiable. The background is clearly identifiable from a distance but lack details. Precision shots may be possible prone with a rifle caliber at or around chest area. 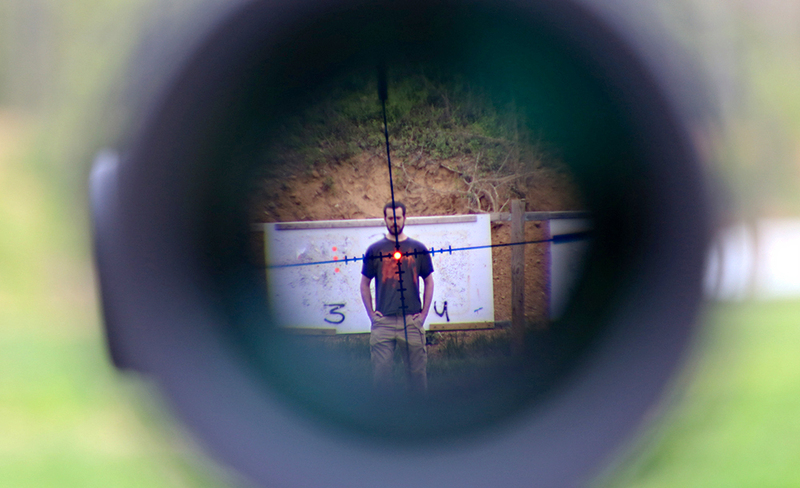 Trijicon Accupower at 100 yards at 4x power. You can make out shapes on the t shirt but cannot read it so patch identification may be difficult. You may be able to estimate size and distance of target based on your reticles ability. 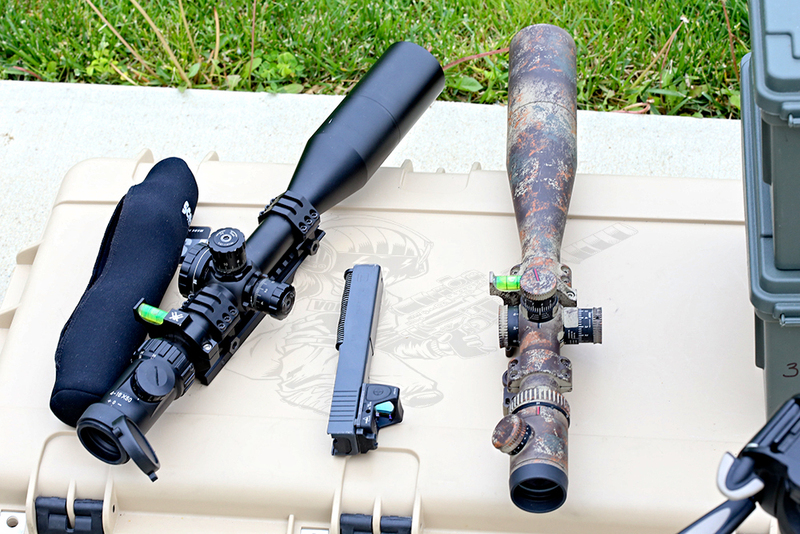 You may be able to get PID on a full size pistol and would be able to clearly identify a rifle at this magnification and distance. Precision shots are attainable while prone with an understanding of hold over and zero. Trijicon RMR at 100 yards, 3.25 MOA red dot will cover most of chest and if standing two hand free style you will see the dot jump around like crazy. At 1x PID would only be possible of a pistol if you see muzzle flash and / or are taking fire from the target. PID may be possible of a target with a rifle, however, this would be a very ineffective distance of contact with a pistol caliber and while you may be able to effect the target with volume of fire, accurate and effective fire from a pistol caliber at 100 yards would be difficult, finding cover and allowing yourself time to flank or gain ground on the target would be a more effective strategy. Aimpoint PRO at 100 yards. As with any 1x optic at 100 yards you will have a difficult time with PID for a pistol but may be able to do of a target with a rifle. With this 2 MOA red dot optic you may be able to effectively provide accurate fire as long as you understand your zero and hold over, compounded with ammunition choice. 16 inch barrel with 77gr OTM? Probably able to produce accurate fire. 8 inch barrel with 55gr? You should probably find cover. Trijicon MRO at 100 yards. Again it appears magnified because of the camera lens and math, but it is actually not. 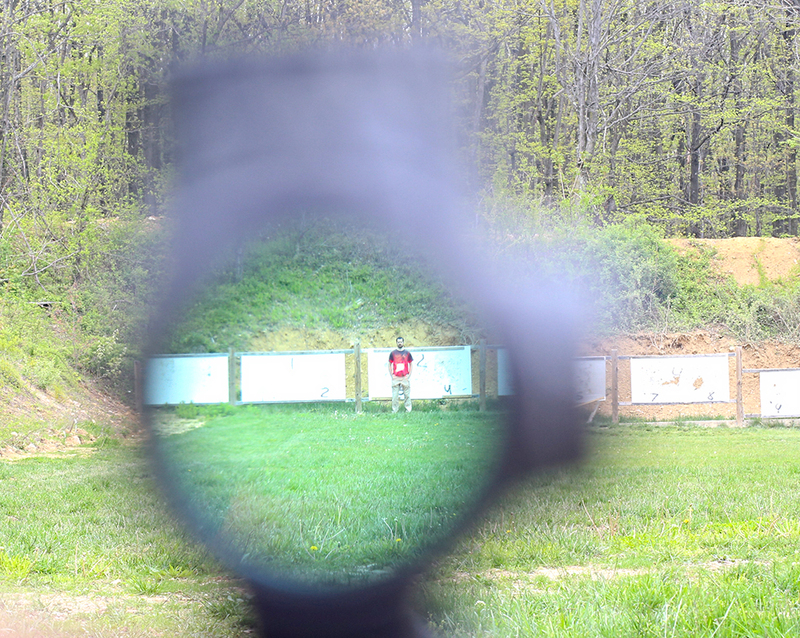 The MRO, while having a larger objective than the PRO and RMR allows for situational awareness while attempting to PID targets. Same issues as the other 1x optics, 2 MOA red dot provides for the ability to produce accurate fire when you understand your equipment. VX at 100 yards on 24x power. You can read the t shirt and therefore be able to make out patch shapes. You can also see facial features and probably be able to PID a pistol or rifle. Background is partially obstructed but not enough to be unable to identify characteristics. Precision shots are attainable. Millett at 100 yards on 16x power. Very similar to the VX except you may not be able to read the shirt so patches may be difficult to identify. PID of pistol or rifle is possible and background is partially obstructed but not so much that it is unidentifiable. Precision shots are attainable. At 100 yards a 1x optic is nearly useless for PID purposes unless the target is shooting a weapon and you can see muzzle flash. 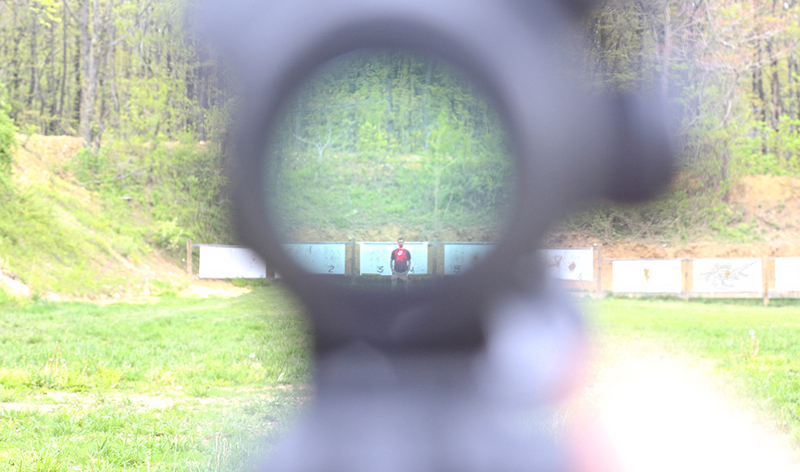 You can, however, effect the target with fire from a 1x optic if you understand your equipment's capability, zero and hold over. At 100 yards a pistol caliber engagement would not be suggested unless you can stabilize the platform and have enough time to produce a well aimed shot utilizing surprise. Of course you may only get one. 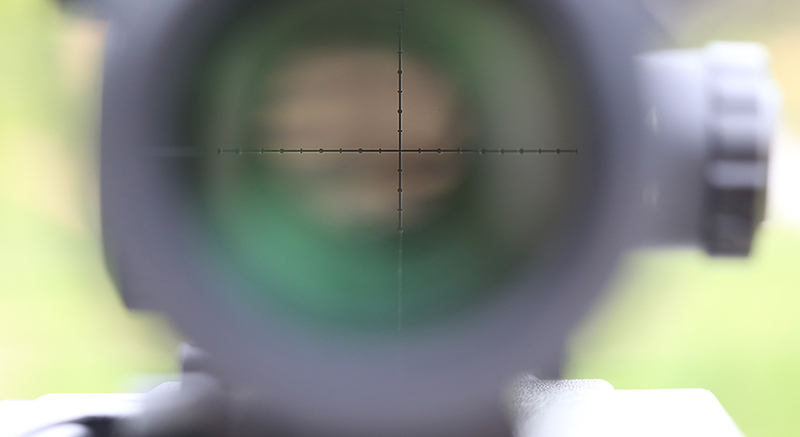 With a magnified variable optic of at least 4x power you should be able to effect the target with accurate fire. With any magnification over 4x, such as 6x - 24x you should be able to effect very precise fire on a target. Shooting accurately at variable distances is extremely important and a goal to reach for all shooters, irrespective of skill level. This becomes even more important when you employ a rifle against others in deadly force confrontations (such as LEOs and during military operations) and it becomes the predominant factor when deadly force is required on US soil. With this understanding the law covering use of force is very important but understanding how your equipment works, then how that equipment choice translates over to engaging a hostile threat is extremely important. Being able to apply effective and precise shot placement may be the deciding factor in a myriad of legal, ethical and moral issues which may arise from such a confrontation. As such, understanding how your firearm works at what distance, respective to optic, ammunition and firearm choice can be the difference between a clear victory or crushing failure with untold levels of consequences. Do your research, educate yourself on your equipment, train with your equipment and work out all the guess work before the day you have to put an optic to use in the real world.